Beignet’s with their perfect cafe au lait pair. We New Orleanians are often asked, what’s all this beignet business? We send visitors home with carefully packaged beignet mix souvenirs, direct tourists towards Cafe du Monde for the perfect late night French Quarter eat, and take photographs of those bright smiles adorned with powdered sugar mustaches. But for people who don’t live in the colorful Crescent City, and perhaps even for those who do, the beignet’s story isn’t so clear. In fact, what it is exactly, is about as mysterious as how to pronounce it. So let’s start simple and see what we can come up with. While the French influence on the Big Easy is readily apparent, the melding of the Cajun dialect and French language can make it difficult to pronounce French Creole words (just ask any local how you really pronounce the street names). Beignet, luckily, is easier on the scale of crazy New Orleans pronunciation, usually said as ben-yay. As for what it is, beignets can most simply be described as French doughnuts. Beignets are made with a yeasted, sweetened dough that, after being allowed to rise, is cut into squares, fried, and liberally doused in powdered sugar. They are light, airy, pillowy pastries. Beignets are classified as choux pastries (pronounced shoe); this means that they are made with a high-moisture dough that creates steam during the cooking process. The steam is what brings a rise to the finished pastry (rather than a rising agent like yeast). Perhaps you find this a little confusing, considering that I just told you beignet dough is yeasted. Most contemporary beignet recipes do include yeast, but even with the use of it, the wetness of the dough is what ultimately creates the fluffy beignets we recognize. The exact history of the beignet is a little foggy, considering it is a pastry that has recipes dating back to at least 16th century France and it has a number of cultural cousin pastries. We do know that beignet is the French word for “fritter,” but even this name stems from another culture. The origin of the word beignet can be traced to the Celtic language, tied to the word “bigne,” meaning “to raise.” Although now considered a French pastry, the beignet is thought to have connections as far back as ancient Rome. The Romans were know to make “scriblita,” a dessert also made out of a high-moisture dough and cooked in boiling animal fat. It’s also thought that the French beignet may have an Andalusian influence, the recipe traveling from Spain into France via the Mediterranean Sea. This influence can be seen when considering the Spanish “sopapilla.” Like both the beignet and the scriblita, the sopapilla is a fluffy, pillow pastry that is fried. Unlike the square beignet, however, the Spanish sopapilla is usually cut into triangles or circles. It’s not hard to guess that the beignet made it to New Orleans through French colonists. 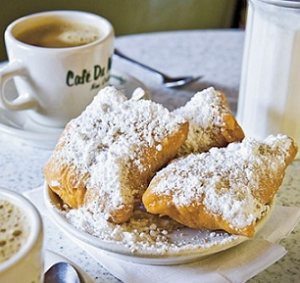 In fact, it’s even a local legend that Cafe du Monde’s beignet recipe was brought from France by the Ursuline Nuns (though like many Big Easy myths, this has never been confirmed). The New Orleans beignet actually, more than just French, has an Acadian influence. For those of you who know your New Orleans history, you know that Cajun is a blend of Louisiana culture with French Canadian. French colonists are thought to have brought beignets with them to Canada in the 18th century and upon their migration down to New Orleans, it became melded with our local culture. 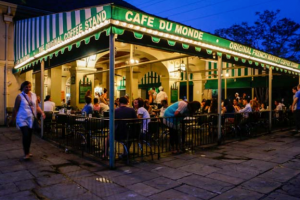 Open 24/7, Cafe du Monde is always welcoming hungry visitors. It would be remiss to write an article on beignets and not talk about the world famous Cafe du Monde, the premiere New Orleans beignet joint. Cafe du Monde originally opened in 1862 at the French Market in the French Quarter. Recognizable by its green and white striped awning, Cafe du Monde has been serving beignets for over 150 years. They stay loyal to the French tradition of pairing the pastry with cafe au lait, a coffee drink made of dark roast coffee, chicory, and equal parts warm milk. They didn’t, however, always call their treat by the name beignet. For many years, especially in the early 20th century, Cafe du Monde’s beignets were referred to as just doughnuts or French Market doughnuts. Locals had a hard time explaining to tourists what made their doughnuts so different, besides the fact that they lacked the hole in the middle. It wasn’t until 1958 that the French Market doughnut was rebranded as the beignet. Much like anything sweet in this city, the beignet’s popularity grew and it was made Louisiana’s official doughnut (yes, we have one of those) in 1986, and the rest is history. Now, just as they have for more than a century, hungry patrons can feed their cravings at Cafe du Monde with an order made up of three beignets served morning, noon, or night, 364 days a year.